Lean how to build you avatara using the avatar creator in Entropia Universe. You can earn real money simply by playing Entropia Universe, read here how RCE works. No other first person shooter games can deliver the same excitement as Entropia Universe - Are you really as good as you think? Planet Arkadia is for you if you want to be a treasure hunter! On the only continent of the planet you can explore ruins and discover treasure and hidden artifacts. Explore Planet Calypso for free for as long as you want from vast deserts to the mountains. Earn a weekly income by purchasing a land deed and watch your wallet grow. Planet Cyrene is a planet teaming with life, and many creatures on Cyrene fight the daily struggle to survive. Along with the multitude of indigenous fauna, Cyrene is also host to multiple intelligent races that have thrived and evolved on Cyrene. Use the dense forest to sneak up on your target and take down your prey. Welcome to the tropical paradise that is NextIsland. Explore the planet and see th beutiful beaches, ancient cities and mythical creatures. 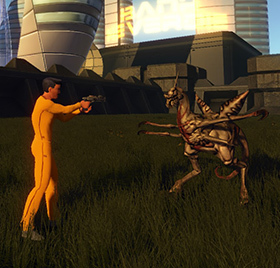 When you hunt in the Entropia Universe you are killing creatures to find what loot they may hold. 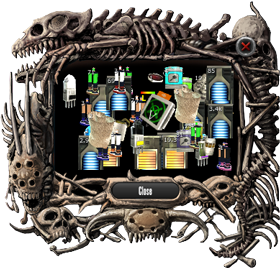 This loot can include such things as ammunition, healing devices, weapons, armor and other items. The value of this loot can vary depending on how common it is. Your loot can be sold to the trade terminal for its base price, sold to other players in private trade, or sold on the auction for a small fee, selling to other players or through the auction will typically allow you to gain more PED from your loots. By selling this loot you can acquire more PED for your adventures. All weapons with the exception of melee, require ammunition to fire which can be purchased from various trade terminals in the game world. There are various types of ammunition and your weapons information panel will tell you which ammo is required to fire it. If you make a mistake and purchase the wrong ammunition, you can trade it back to the terminal for full price and buy the proper type. Your weapons can be fully repairable as they decay from use or limited, which will cease functioning once the condition has worn down. You can use pistols, carbines, rifles, melee, mindforce and projectile weapons to name a few. As you hunt you will acquire new skills and can specialize in a specific class of weapon or use all of them if you would like. It is a good idea to specialize in a weapon first and then use the other weapons after you get better. The starter weapons for beginners to use are sold at the trade terminals, or you may find other options for beginning level players on the auction house. These starter weapons will help you to gain skill in the weapon class of your choice giving you the ability to use more powerful weapons. It's also a good idea to get yourself a medical tool to heal yourself from the damage creatures do to you, these are available in the trade terminal and on auctions. As a new player in Entropia Universe you should stay close to a revival terminal when hunting, this way if you die it is easy for you to run back to the creature you were trying to kill and finish it off. At the sweat camp are large groups of low level creatures you can hunt, the beginning missions should help guide you to these areas. If you go out too far and get killed you may respawn at a dangerous area and not be able to get back to safety. If you find yourself lost and surrounded by creatures you have a few options. First you can try to sneak around the creatures by keeping them at max distance on your radar but this can be difficult with aggressive creatures. If you are near water, get into the water and use your map to locate where you want to go. The creatures chasing you will die after a short period once they get into the water. If you can make it to the coast, hug the shoreline because there are not many creatures close to the shore and you should be safe. You can also wait by the outpost or city you are at for a more experienced player and ask them to help you get back to safety. When hunting beginning level creatures wearing armor will help you to survive longer however your armor will decay as you are hit by creatures, to repair this decay you will need to spend PED at a repair terminal. Low level creatures typically drop armor that is suitable for your hunting level, identify the damage type the armor you have is best suited for and test it out on different creatures to see where it is most effective. The loot system is random and during one hunt you may make a lot of PED while at other times you may lose money. It is a good idea to change positions if you are not having luck in one area as it may change if you move someplace else. If a player receives a larger value of loot in a single creature, the global chat log announces a “global” event and your avatar will have lights and sounds flashing around it for a short period. These events don’t happen all the time and are not very common for low level players but once you get better you will experience them more often hunting higher level mobs. The other event is a “hall of fame” event, this will happen when your loot is one of the 100 highest of the day, your loot will be an all time high and be displayed in the hall of fame board.